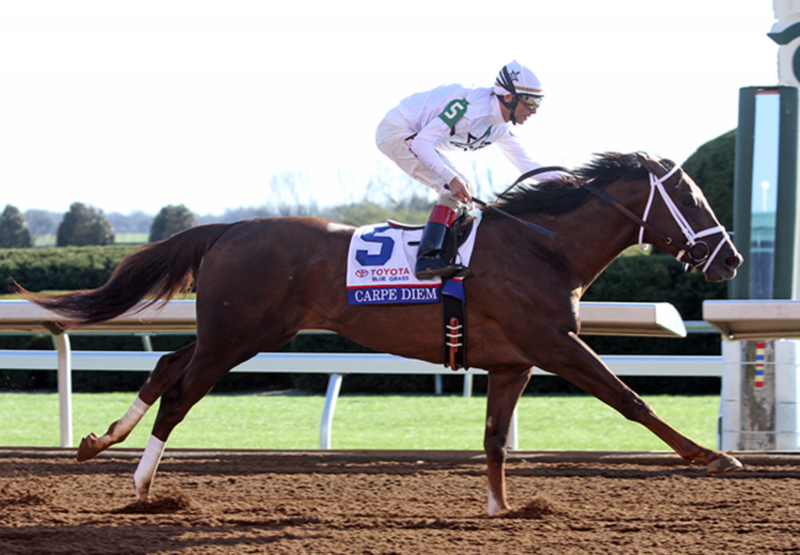 Exciting colt Carpe Diem (3c Giant’s Causeway x Rebridled Dreams, by Unbridled’s Song) staked his claim for the Grade I Kentucky Derby when scoring a resounding win in the $1million Grade I Keeneland Blue Grass Stakes on Saturday. A $1.6 million OBS March 2YO Sale purchase, Carpe Diem earned high praise and TDN Rising Star status for his powerful debut win at Saratoga last year and followed it up with a Grade I win in the Claiborne Breeders Futurity at Keeneland. Second in the Grade I Breeders Cup Juvenile, the Todd Pletcher trained son of champion sire Giant’s Causeway showed when winning the Grade II Tampa Bay Derby at his first run this year that he was a serious contender for the Kentucky Derby and confirmed his status with this win. Sent out favourite, he stalked the leader before cruising clear to win the 1 and 1/8th mile event by three lengths. “There wasn’t much speed in the race. It was a nice slow pace and I didn’t want to fight him very much,” said winning rider Johnny Velasquez. “He was doing it pretty easy. Like Todd (Pletcher) said, ‘Don’t fight him, just let him do it.’ Down the lane, I asked him and he responded right away. Once he gets to the lead, he wants to wait, so I have to make sure I keep his mind on running.” Carpe Diem has now won four of five starts earning $1.5 million for his owners WinStar Farm and Stonestreet Stables. “It was awesome. We knew we had a great horse. Todd (Pletcher) had him in great shape,” said part-owner Barbara Banke of Stonestreet Stables. “I was happy to see that he loaded into the gate nicely. He broke well. And then, it was just a matter of Johnny (Velazquez) telling him to go at the right time and he went. It was really nice race. “Like some of the other great horses I have had, he is a fighter and a contender.” Carpe Diem is a half-brother to Grade I winner J.B.’s Thunder and stakes-winner Doncaster Rover being the fifth winner from stakes-winner Rebridled Dreams.